Mom's Gone Bronson! : Let Jennie-O Help You Slide Back to School with Recipes for Success! Let Jennie-O Help You Slide Back to School with Recipes for Success! Disclaimer: I was provided with product in exchange for an honest opinion. Your views may differ to mine. Thank you! It is back to school time and Jennie-O has great online resources for busy moms to help the transition back to regular meal times go as smoothly as possible - and with a few handy tips and tricks to keep things running like clockwork, as well. How about Turkey Tacos to go, Turkey BLT or Brunch in those school lunch boxes? These will keep the kids from getting hungry and they'll be full and satisfied. And what about mom? All that running about, you might want to think about some make-ahead mason jar salads, which are all the rage, right now and really easy to make ahead when you make the kids lunches, and just grab them to go when you're hungry or when you have to pack a lunch of your own. This five minute Mediterranean salad is right up my street and so simple, it takes no time at all. "Packed with veggies, packed with protein and packed into a jar, this portable picnic pleasure is a quick and easy Mediterraneansalad treat. No gluten and under 500 calories per serving!" - Jennie-O Website (in reference to the Mediterranean salad). In under 15 minutes you can prep your salads and store them ready for the day/s ahead and with simple, protein packed goodies and in a relatively low calorie count, I can even eat these on a flex lunch or dinner on the plan I am on right now AND other members of my household will appreciate these, too! Jennie-O has a list of snack ideas to keep your kids (and you) going through the day, and lunch ideas to keep things fresh! If you also want to know how to keep an apple from turning brown, yet still be able to send it to school as sliced, then you can find out how, here! They've just about thought of everything. I personally like to take some turkey with crackers and cheese for the kids to snack on any time of day, and I also like to make up a big vat of either turkey chili or turkey bolognaise to freeze down in portions to heat and serve as the week goes by - usually prepping on a Sunday for the week gets the job done, but whatever suits your schedule is the way to go. SO! When you are getting ready to go back to school this week, maybe when you are in the larger stores buying up school supplies, just stop and think about the food for a moment and see if Jennie-O can make it easy on you and the transition back to this regular, sometimes tiring, routine that is school! Got any recipes for turkey, or some fun back to school tips and tricks? I'd love to hear from you. 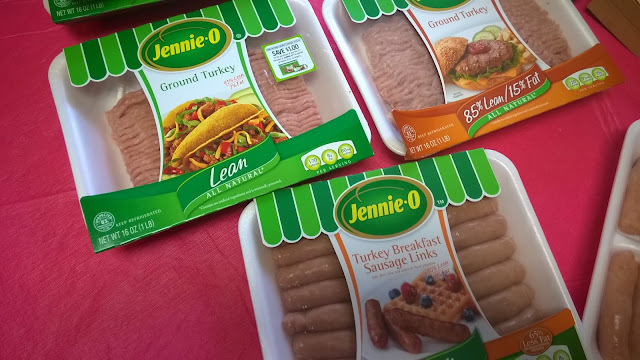 In the mean time, find Jennie-O on social media like Twitter and Facebook with hashtag: #switchtoturkey. With turkey recipes, how-tos and a menu for your lunch boxes to keep things simple, back to school never tasted so good! I am a Jennie-O convert! You can make so much with their turkey products and it is much healthier for you.